A GPS tracker is one of the most useful devices currently on the market for pets. When your dog consistently gets too hot, you can solve the problem with cooling pads for dogs or cooling vests for dogs. When your dog doesn’t get enough activity, you can compensate with an automatic fetch machine or dog activity monitors to find out where the problem is. But what if your dog is an escape artist and gets out all the time? That’s exactly where a GPS tracker can come in. A GPS tracker is a device that can alert you when your dog gets out, and tell you exactly where to find them, so that you do not spend hours driving around your neighborhood or are sitting at home worried because your dog is not yet come home. But how do you choose the right dog GPS tracker? That’s exactly what we are going to cover in these reviews and in this buying guide. These are the top five dog GPS trackers currently on the market. These are all really great devices, and they have all of the features that you need to make sure that you know where your dog is at all times and that you are alerted when they wander from the area where they are supposed to stay. Let’s take a look at each of them one by one because they all have a little bit different design and their own advantages. 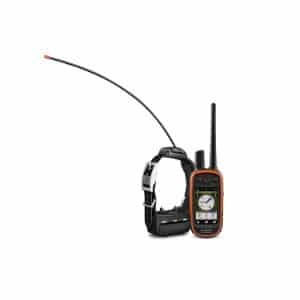 This Whistle 3 GPS is one of the best Christmas presents for dogs that you can get. If you do not keep your dog in an outdoor dog kennel, and they have a tendency to get out of your yard with their dog collar or dog harness intact, then a GPS pet tracker might be the perfect solution for you. This is suitable for many different breeds including Yorkshire Terriers, Boxers, Huskies, Great Danes, Poodles and Beagles. 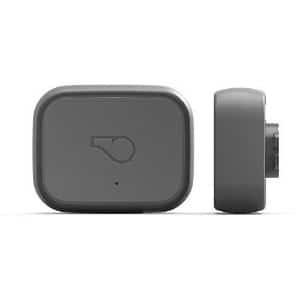 This GPS dog tracker attaches to your pet’s collar or harness, and allows you to see exactly where they are and be alerted when they leave a pre-designated safe zone that you set up. However, this is not just a GPS locator. Like many of the best GPS locator units on the market, this is also an activity monitor. That means that it measures your dog’s activities and keeps track of vital statistics that you need to be aware of about your dog. You can interact with it using the app that can be downloaded for iOS or android devices. You do need to keep in mind that this works on the cellular network, as well as with other locating technologies, and it is a few dollars a month to maintain your dog cellular plan so that you can track them anywhere in the country. Plans starts at $6.95 a month and they are set up when you activate the Whistle app. You get alerts by text, email or notifications on the app itself when your pet leaves the pre-designated safe zone. You also get tracking on what kind of activities they got up to during the day, how much time they spent resting and a bunch of other vital bits of information. You can even see where they went over the last 24 hours. This comes with a rechargeable battery that lasts up to seven days, and it is an extremely well-made unit that is durable and completely waterproof. This is one of the top GPS tracker and activity monitor units on the market right now, and it is a good choice for many different breeds including Labrador Retrievers, Golden Retrievers, German Shepherds and French Bulldogs. This AKC smart dog collar from Link is another terrific GPS locator for dogs as well as an activity monitor. These are the cream of the crop when it comes to dog GPS trackers, so it is no surprise that they all come with high-performing activity monitors as well. If you have a GPS for dogs, then you don’t have to keep your dog in a dog crate or dog playpen as often, and you can worry less about them running off when they don’t want to get a dog shampoo. If they do run off to avoid a puppy shampoo, you will be able to track them down easily with a GPS tracker, and this one is definitely pretty amazing. This is not just a collar attachment for your dog, this is an actual collar and it is one of the best-looking collars out there. This smart collar works with both iOS and Android, and although it does require a service plan, it is still one of the best values for your money. It includes an extended warranty in pretty amazing customer service including a 24-7 helpline and a size guarantee that makes sure that the dog collar fits or they replace it. You get nationwide location tracking that is completely accurate and instant, hosted on the AT&T cellular network, as well as alerts to let you know when your dog leaves the designated areas. Other features include activity monitoring and sound training. You can set activity goals that are modeled after American kennel club standards, allowing for your dog’s age, size, breed and more in order to get accurate monitoring and know whether your dog is healthy. The remote sound activation allows you to train your dog with very sounds, and it includes things like temperature alerts to let you know if your dog’s environment is too hot or too cold, and LED light so that your dog can be seen at night and long lasting battery life that doesn’t have to be your recharged but every three days or so. Garmin is well-known for making GPS systems for your vehicle, but they also make GPS systems for your pet. There are several things that make this Garmin unit completely unique even among all of the amazing GPS tracking devices that are located in this buying guide. This is an all-inclusive unit, meaning that you don’t have to use your phone or buy any additional accessories for this, it comes with everything that you need to track your dog over long distances without having to pay extra for a cellular plan each month or do anything else. In addition, this is probably the most rugged GPS unit out there, and it is perfect for large dogs. What really makes this unique is that it comes with its own handset as well as being a rugged and fully-featured collar. This high-sensitivity GPS tracker for dogs is already included with over 100,000 US maps, features an LED beacon light and can be activated in rescue mode. It also features training stimulation which issues a small electrical shock similar to a static charge through the caller as well as sound training and vibration training. It is rechargeable, but the battery lasts for almost 2 days, and you can set up all kinds of virtual boundaries on your map and get an alert automatically to let you know when a dog has breached your barrier. It is also pretty amazing that you can track up to 20 different furry friends with this single unit, and it will let you know where they are anywhere within nine miles of the GPS handset. There are a lot of GPS units for dogs out there, but there is nothing like this one. This Garmin unit is rugged, durable, able to withstand all kinds of conditions and is packed with features that you will love. It may not have as much on the activity monitor side as some of the other ones on this list, but as far as tracking your pet wherever he or she goes, this is definitely one of the best solutions out there. There are a lot of great features with this GPS tracker device for dogs. You can set up to three fences with a single device, and you can get alerts immediately when your dog gets out. The way that this device works is with the micro-sim card and then you download the app and sink it with your device. The nice thing is, there is no service planner monthly fee so you don’t have to worry about maintaining a cellular plan for your puppy. You have to buy the sim card separately though. Once you do, you’ll be able to monitor your pets in real time, simply using the app to see what your pet is seeing. The location and tracking displays in three different modes; there is regular mode, satellite mode and night mode. You get to choose start and end times so you can see your dog’s movement route. This device will fit just about any size of pet, and it fits any collar up to an inch wide, but it is better for smaller pets. It isn’t waterproof, but it is water resistant. The price is terrific, making this one of the best budget options on the list. Pod Trackers makes the last dog collar GPS tracker on the list, and this one features an innovative design and a really cool interface. It comes with two different units, one of them that fits on your dog’s collar and the other that plugs into your computer via USB. The only thing to keep in mind is that the attachment on the collar is a little too large for the very smallest of dogs. However, this GPS tracker does have some pretty amazing features and it is a combination activity monitor and tracker as well. You can locate your pet indoors or outdoors in real time with your phone or computer. You can set predesigned safe zones that let you know when your pet leaves the boundary. You can also monitor your dog’s fitness levels to make sure that there healthy and getting plenty of exercise, and this particular GPS tracker for dogs and activity monitor works in more than 175 countries – essentially anywhere in the world. This may not have some of the advanced fitness tracking in activity monitoring features as some of the earlier listings that we reviewed here, but it also doesn’t have the huge price tag. This is one of the best models on the market for both affordability and function, giving you everything that you need without stuff that you will hardly ever use, and ensuring that you are able to find your pet anywhere in the world – which after all is the primary purpose of the device. Plus the pod simply looks really cool. 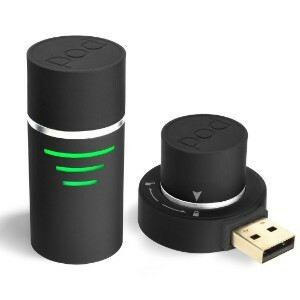 Both the caller attachment and the USB device are pod-shaped which is a pretty innovative design. You have to look at lots of different things when it comes to buying a dog GPS tracker. You have to decide whether you simply want something that will track your pet or whether you want more advanced features like dog activity monitoring and lots of information that you can use to determine how healthy your dog is whether he or she is getting enough exercise. You also need to figure out the distance that you want to track your dog, and whether you need a tracker that works just a few miles around your monitoring device, or whether you need to track your dog anywhere in the country or world. In addition, there are other factors to keep in mind as well. You want something that is going to be totally accurate and allow you to find your dog if he or she escapes without any guesswork. You also want the right size that is going to fit on your dog’s collar without being obtrusive, gives you the right notifications, allow you to set up the zones that you want and is durable and water resistant so that if it rains, you aren’t going to have to replace your dog GPS monitor. Let’s look at each of these factors in detail below. There are lots of benefits that come with having a GPS tracker. Of course, the benefits that you get will depend wholly upon what kind of features your particular GPS tracker offers, but as far as the GPS tracker itself, it offers you peace of mind knowing that you will be able to track down your dog anywhere if he or she escapes. Some dogs run off occasionally, getting out through the fence or by someone accidentally leaving the dog gate open, and some people that have expensive breeds with high pedigrees have to actually worry about their dog getting stolen. In cases like these, it is extremely beneficial to have a GPS tracker attached to your dog so that you can figure out exactly where they went simply by the logging into your smartphone. A GPS tracker definitely has benefits for certain types of activities or lifestyles. For people that own large tracts of land, having a GPS tracker on your dog is almost a prerequisite. Since they are running all over the place, you have to be able to know where they are and keep tabs on them in case anything happens. But GPS trackers are also perfect for those who take their dogs on hikes with them or who go out on hunting trips into the woods. Knowing where your dog is at all times can give you incredible peace of mind and alert you quickly to a situation that you can resolve. GPS trackers are also great for families that have dogs that are extremely energetic or who bolt through the fence at first opportunity. There are some dogs out there that are known for their speed, giving you no chance whatsoever to catch them. There are also dogs out there that crave adventure, and sometimes that means exploring what lies beyond your electric fence. If someone accidentally leaves the gate open, or if you take your dog for a walk and have a loose hold on the leash at the wrong time, it could take you hours or even weeks to find your dog again. After all, that’s why people put up missing pet posters. But with a GPS tracker, you can know exactly where your dog is and find them before someone takes them home or the dog catcher shows up. Some pets are also escape artists. If your dog has a history of digging a hole to get underneath the fence, wriggling out through a weak spot or finding other ways to escape the yard, then a GPS tracker can ensure that you are alerted immediately when they escape and you can track them down quickly. Understanding how dog GPS trackers work will give you a much better handle on how to choose the right one. A GPS tracker for dogs is a device that uses the same GPS technology that you have on your smartphone order to get around. It is a small gadget that amount on your dog’s collar – or actually is a canine collar – and it sends out signals, telling you the location of your dog as long as he or she is wearing the device through a variety of means that can include Wi-Fi, GPS, cellular signal or Bluetooth. Through these methods, you can find out exactly where your dog is when you need to track him down. Often, GPS trackers for dogs incorporate other features as well, but the primary function is to show you how to find your dog in the event that you lose track of them. Most commonly, GPS trackers for dogs will work with some kind of application that you can download to your smartphone or device. How your device works specifically will depend upon included features, with some of them requiring a cellular plan in order to track your dog through your smartphone, and others using methods that do not require a monthly subscription fee. There are several types of GPS trackers available. However, there are two types that are the most common out there: radio pet trackers and GPS pet trackers. Both of these methods have their advantages and disadvantages, but keep in mind that they are not microchips. Sometimes, when you rescue a dog, they come with the microchip embedded under the skin so that if your dog gets lost, someone with the microchip reader can find out who the owner is and get them back to you. Some people think that this is the way that GPS trackers work, but in actuality there are vast differences. Radio pet trackers work in a similar fashion as two-way radios like walkie-talkies. There is a radio transceiver that is attached to your dog’s collar and a handheld device for you. This is exactly the type of technology used in the Garmin device that is reviewed above. Transmitting radio signals from your handset will be received by the device and transmit information back to you. This allows you a great deal of control and you can use things like vibration and sound alerts in order to conduct training. However, these radio collars or radio collar attachment devices have the disadvantage of limited range. They still are viable for miles, but simply do not have the range of GPS trackers. However, for people who live in an area where cellular service is spotty, radio signals are the best way to equip your dog with a tracking device. Speaking of GPS trackers, they have some major advantages as well. For one thing, GPS trackers can be used anywhere in the country – and sometimes anywhere in the world. They rely on satellites that are orbiting the earth. They provide a high level of precision and accuracy, and do not require a separate device in order to access the data. You can simply use your smartphone and login via an app in order to find out exactly where your dog is, where they have been and monitor all sorts of other things as well. Choosing the right size is important. You have a couple of choices when it comes to dog GPS trackers. 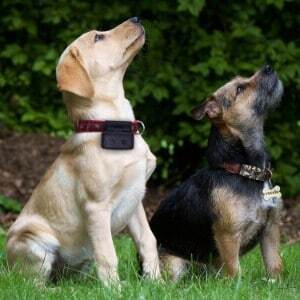 The first is a device that attaches onto your dog’s collar, sometimes much like a dog tag would but more commonly as a larger device that clamps on the side of the collar, or you have the option of getting a collar that already has GPS technology embedded into it. In either case, you want something that is going to fit your dog perfectly. When it comes to dog collars, you are often pretty restricted on what size you can get. While a standard dog collar may come in everything from extra small to extra extra-large, GPS embedded collars might only come in a couple different sizes. However, you also need to be concerned about size when it comes to GPS devices that attach onto the collar. The wrong size not only means that your dog will be able to escape without you tracking him or her down, but it could also mean allowing for the GPS device to get destroyed. You can pretty much go as small as you want though, even if you have a large dog. As long as the device is able to fit on the collar securely and will not come off, you should be fine. There are a few other things to consider when it comes to choosing the perfect dog GPS tracker. Let’s take a look at each of these things one by one so that you can know what to look for when you are shopping and be able to understand what is most important when it comes to choosing a location monitoring device for your dog. How accurate your dog GPS tracker happens to be is a certainly a consideration. You want it to be as accurate as possible, but that will depend upon whether you are using radio or GPS to track your dog’s location. While there are some definite advantages of radio, it does have less accurate location tracking then other methods like GPS. GPS provides you with a location in real-time, and as your dog moves, the GPS market moves. But with radio, you may have to activate the device and ping it to get a location. Accuracy is important when it comes to a GPS tracker, because you want to be able to find your dog when you use your device. If you are not able to track down your dog’s location and get him or her back into your car when they run off, then your GPS tracking device does very little good. However, this is probably not the most important feature, especially for some users. You will have to balance out the accuracy with some of the other features listed here and figure out what is most important for you. Tracking your dog’s activity is not something that every GPS tracker on the market does. However, it is a common feature with many of them. You will have to decide for yourself whether or not this is something that you want include with your dog GPS tracker. You also have to decide how comprehensive you want the activity tracking to be. Dog activity monitoring is something that is useful to owners and vats, because it shows your dog’s behavior in a way that you normally do not get to see. You are able to determine if they are getting enough sleep, after sleep is the uninterrupted, as well as what they do when they are awake. Some dog activity monitors that are combined with GPS units provide even more detail. For example, some dog activity monitors actually monitor your pet’s heart rate, blood pressure and alert you when there is a possible medical problem that you need to see your vet for. Some of them even store vet records in sync with your veterinarian software. The more fully featured and comprehensive your activity monitoring is, the more you’re going to pay for your dog GPS tracker. You will have to decide whether this is a priority consideration when it comes to choosing the right GPS unit. It can definitely be a useful feature though, and it saves you from having to get a separate activity monitor later. Two such devices attached to a collar will likely be uncomfortable. The way in which you are notified when it comes to your dog leaving the safe zone is also important. For example, you can receive an alert via text message, an app notification, an email or some other method. This is something that you want to carefully consider because getting the right notification can mean the difference between getting your dog back sooner or finding him before he has run too far. The ideal situation would be to receive alerts in his many mediums as possible, but this is not always possible. You definitely want to check the alerts when it comes to buying a GPS system for your dog, because the more alerts that you can get, and as many mediums as possible, will mean more value for your money in a better GPS unit. Making sure that your GPS tracker for dogs is durable and weatherproof is also something you need to worry about. When it comes to durability, remember that your dog will be wearing it around their neck throughout the day. You may have to take it off of their collar once in a while to recharge it, but for the most part, you want your dog to be wearing in 24-7. That means that it is going to have to be durable and made to last. But it is also got to be weatherproof. This is especially true when it comes to rain and snow. You wanted to be water resistant, or waterproof completely if at all possible. If your dog has the propensity to jump into a lake whenever you go near one, then you definitely have to worry about shorting out the GPS unit and should get one that is waterproofed completely. You also need to think about safety zones. Safety zones are the areas where you have set up places for your dog to play. As long as your dog is inside a safe zone, the GPS tracker will not alert you and let you know. However, when they pass over the boundaries of the safe zones, then you get notified. This is extremely helpful because you know exactly when your dog got out and can come home and look for him. However, you want to make sure that you get all of the safety zone features that you need, including alerts on which particular barrier was breached so you know which way your dog went and being able to set up multiple safe zones at once. The bottom line is that there are a lot of things to keep in mind when it comes to getting a GPS tracker. You have to decide if you want to get an activity monitor at the same time that you get a GPS tracker, and how much you want to spend on one. You also need to make sure that has all of the features that you need, including support for multiple dogs if you happen to have any others; as well as additional pets. Getting the right dog GPS tracker can be challenging, but it is well worth it because when your dog gets out, being able to know exactly where to look for him or being able to track him in real time using your phone is a pretty amazing benefit.